OSSC Junior Assistant Recruitment 2017: It is here to great news for those candidates who are waiting for the vacancies in the Odisha Staff Selection Commission under the government of Odisha. 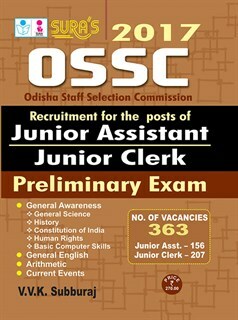 The Odisha Staff Selection Commission has been released the 363 posts of the Junior Assistant & JR Clerk. So Eligible candidates may fill up the OSSC Junior Assistant & Clerk Online Application form 2016. Surabooks.com released the new version of OSSC Junior Assistant Recruitment 2017 exam books online shopping applicable .